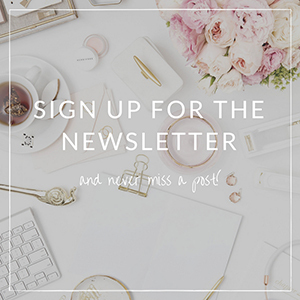 If you are subscribed to Organic Beauty Blogger’s newsletters (you can become a subscriber here), then a couple of days ago you have received a letter from me describing what joys only Autumn can bring. 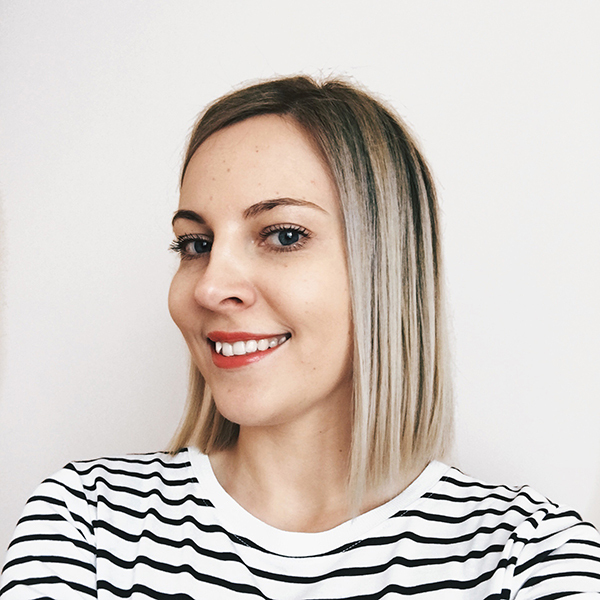 I forgot to include one important thing: as evenings are getting shorter, I noticed that I’m becoming more thorough with my beauty routine and taking the time and effort to pamper my skin. 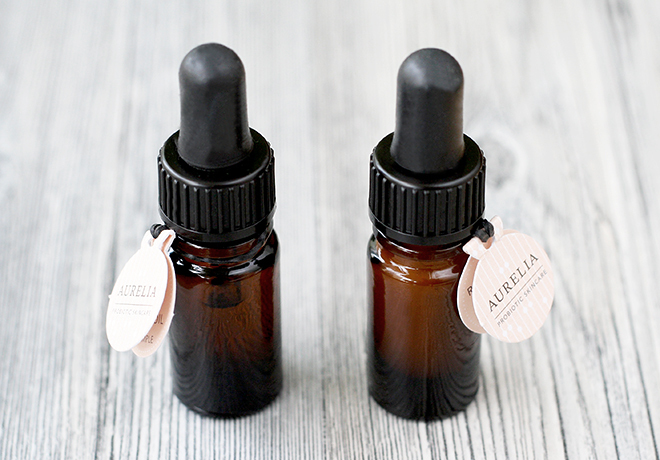 One of the brands that I’ve been using lately during my SPA evenings is Aurelia Probiotic Skincare. 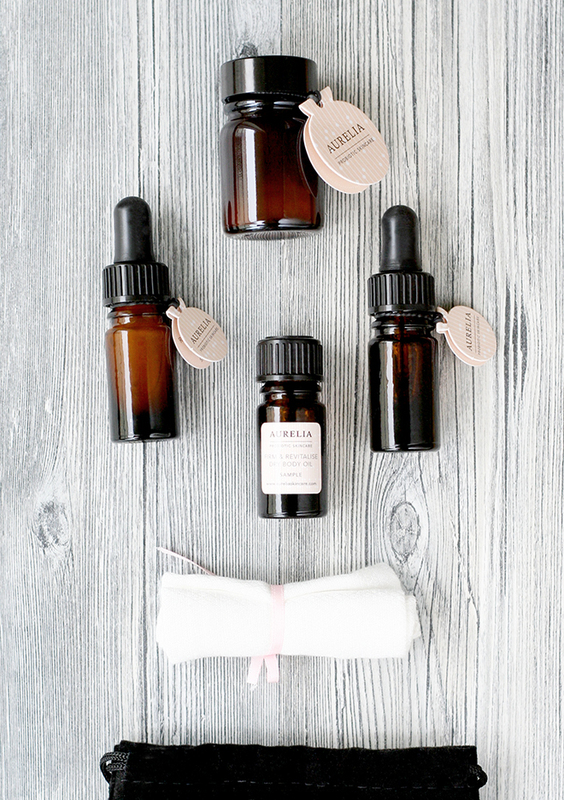 This brand is praised for its therapeutic, natural beauty products formulated with probiotics. Many of us know how beneficial probiotics are for our gut, but a research explains that probiotics are helpful for our skin as well. Especially, in treating some major skin care problems, like acne and rosacea. All the scientific facts aside, I also can’t help but feel very sophisticated when using these fancy products. As I am not big on using cream cleansers, but I read so many good reviews about this Miracle Cleanser that I didn’t even let myself think that I won’t like it. And I was right. 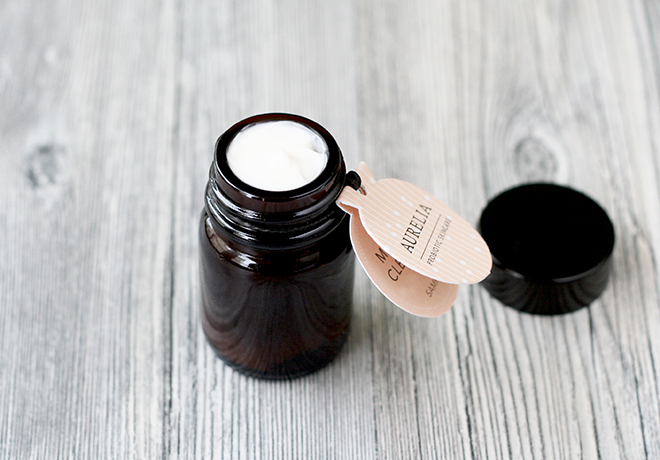 This little (sample) jar of a cleanser made my skin happy. 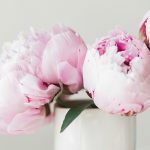 Because of the season changes, I’m reaching for more indulging, deeper scents that are a complete opposite to fresh and fruity summer scents, so I give this utterly captivating and soothing scent 10 out of 10. My nose detects eucalyptus, chamomile, and a trace of rosemary, which is a powerful mix if you ask me. Another thing that I want to point out, Miracle Cleanser is different from most cleansers because it needs to be used on dry skin (yes, I was surprised by that too). The secret is to apply the cleanser to dry skin and massage it with your fingertips to remove any makeup and dirt as well as stimulate blood circulation. Then untie that cute pink bow and make a bamboo muslin cloth warm and damp. Remove the cleanser with the cloth and enjoy soft and smooth skin. Though it removes my makeup well, I remove my mascara before using this cleanser to avoid a mess that a mascara can bring. I know that many of you with oily skin types are cautious about cream cleansers, but this one feels pretty light and non-greasy, so I’d say it’s suitable for all skin types. Aqua/Water (Purified Water), Dicapryl Carbonate (Coconut-derived Cleanser & Emollient), Cetearyl Alcohol (Vegetable Based Thickener), Glycerin (Vegetable Glycerine), Cocoglycerides (Emollient from Coconut Oil), Butyrospermum Parkii (Shea Butter), Glyceryl Stearate (Natural Glycerides & Thickener), Cetearyl Glucoside (Corn Sugar Emulsifier), Rhus Verniciflua Peel Wax (Berry Wax), Theobroma Cacao (Cocoa Butter), Kigelia Africana Fruit Extract (Botanical Kigelia Africana ), Hibiscus Sabdariffa Flower Extract (Hibiscus Flower), Adansonia Digitata Fruit Extract (Botanical Baobab), Lactose (Probiotic Bifidoculture Milk Extract), Lactis Proteinum/Milk Protein (Probiotic Protein), Bifida Ferment Lysate (Probiotic Culture), Schinziophyton Rautanenii Kernel Oil (Botanical Ubuntu Mongongo Oil), Panthenol (Pro-vitamin B5), Sodium Ascorbyl Phosphate (Vitamin C), Rosmarinus Officinalis Leaf Oil (Rosemary Essential Oil), Citrus Aurantium Bergamia Peel Oil (Bergamot Essential Oil), Anthemis Nobilis Oil (Chamomile Essential Oil), Eucalyptus Globulus Leaf Oil (Eucalyptus Essential Oil), Xanthan Gum (Natural Based Stabilizer), Sodium Stearoyl Glutamate (Naturally Derived Emulsifier), Tocopheryl Acetate (Vitamin E), Benzyl Alcohol (Preservative), Dehydroacetic Acid (Preservative), Citric Acid (Fruit Derived pH Regulator), Limonene*, Linalool*. *naturally occurring in essential oil. Vegetarian. Regenerating, repairing, and toning night oil packed with mongongo, Kalahari melon seed, baobab, and pomegranate oils. Not exotic enough? Add firming Kigelia Africana (sausage tree) fruit extract to the list! Neroli scent completely rules this oil and gives it a relaxing and soothing scent. It’s an overnight treatment oil with a lovely medium-thick consistency. 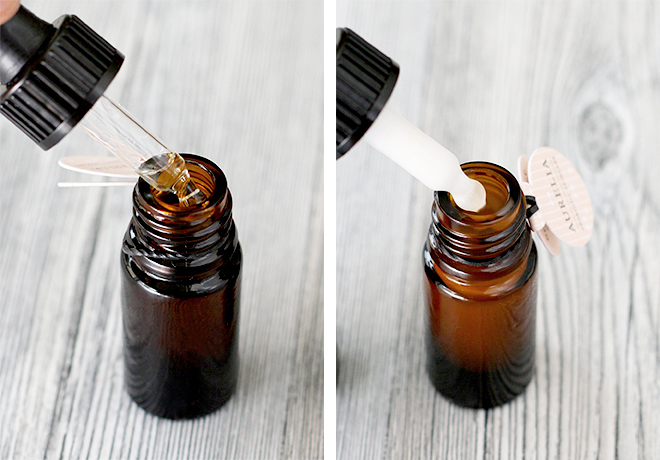 One little drop goes a really long way with this oil, so don’t get carried away, otherwise, it will take a while (but not forever) to sink in. It gives moisture and soothes the skin without leaving it greasy. Prunus Amygdalus Dulcis Oil (Sweet Almond Oil), Cannabis Sativa Oil (Hemp Oil), Triticum Vulgare Oil (Wheat Germ Oil), Olea Europaea (Olive) Fruit Oil, Schinziophyton Rautanenii Kernel Oil (Mongongo Oil), Citrullus Lanatus Seed Oil (Kalahari Melonseed Oil), Punica Granatum Seed Oil (Cold Pressed Pomegranate Oil), Adansonia Digitata (Baobab) Seed Oil, Kigelia Africana Fruit Extract, Helianthus Annus (Sunflower) Seed Oil, Hibiscus Sabdariffa Flower Extract, Citrus Aurantium Dulcis Flower Oil (Sweet Orange Oil), Citrus Nobilis Peel Oil (Mandarin Oil), Lavandula Angustifolia Oil (Lavender Oil), Rosa Damascena Flower Oil (Rosa Damascena Oil), Tocopherol (Vitamin E), Tocopheryl Acetate (Vitamin E), Limonene*, Linalool*, Citronellol*, Geraniol*, Hydroxycitronellal*, Citral*. *naturally occurring in essential oil. Vegan. I honestly don’t know who would want to use serums other than natural when there are products like this Revitalise & Glow Serum in the market. I can’t recommend it enough for everyone who’s tired of dull, dehydrated skin (no matter its type) and wants to give it some glow and life. This serum can be used in the morning and in the evening after cleansing your face. It can also be used as an overnight treatment, but it’s different from Cell Repair Night Oil because it’s much lighter in consistency and absorbs even faster. Therefore, it noticeably hydrates the skin, leaving it radiant, even, and simply beautiful. After using it as an overnight treatment, I wake up and the glow is still there. Also, I completely agree that it’s suitable for all skin types. I believe that even oily skin types will enjoy using this serum. Aqua/Water (Purified Water), Aloe Barbadensis Extract (Aloe Vera), Bifida Ferment Lysate (Probiotic Culture), Cocoglycerides (Emollient from Coconut Oil), Glycerin (Vegetable Glycerine), Lactose (Probiotic Bifidoculture Milk Extract), Lactis Proteinum/Milk Protein (Probiotic Protein), Coco-caprylate (Coconut Based Emollient), Cetearyl Glucoside (Corn Sugar Emulsifier), Cetearyl Alcohol (Vegetable Based Thickener), Kigelia Africana Fruit Extract (Botanical Kigelia Africana), Hibiscus Sabdariffa Flower Extract (Hibiscus Flower), Adansonia Digitata Fruit Extract (Botanical Baobab), Tocopherol (Vitamin E), Citrus Nobilis Peel Oil (Mandarin Essential Oil), Helianthus Annuus Seed Oil (Sunflower Oil), Jasminum Officinale Flower Extract (Jasmine Essential Ol), Plumeria Acutifolia Flower Extract (Plumeria Essential Oil), Polianthes Tuberose Flower Extract (Tuberose Essential Oil), Xanthan Gum (Natural Based Stabiliser), Sodium Stearoyl Glutamate (Vegetable Derived Emulsifier), Sodium Magnesium Fluorosilicate (Nano) (Naturally Occurring Mineral Salts), Sodium Phytate (Natural Origin), Glyceryl Caprylate (Coconut-derived Emulsifier), Benzyl Alcohol (Preservative), Dehydroacetic Acid (Preservative) , Citric Acid (Fruit Derived pH Regulator), Limonene*, Linalool*, Benzyl Benzoate*. *naturally occurring in essential oil. Vegetarian. 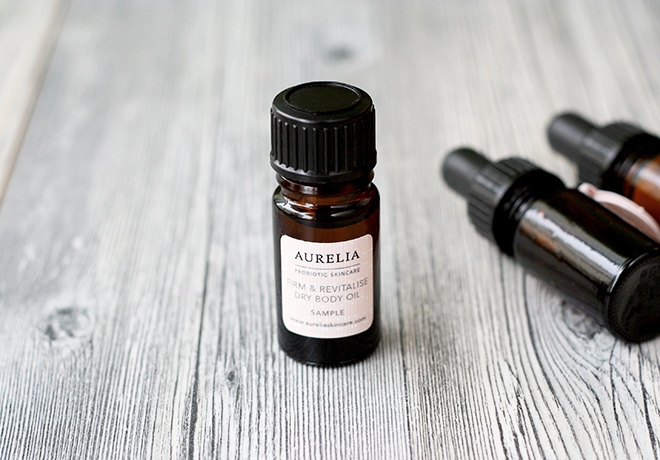 Because it has neroli essential oil as a key scent, this Body Oil smells very similar to Cell Repair Night Oil. The scent is quite intense and can stay detectable on the skin for a while. It might be overpowering or even irritating, if you’re sensitive to strong scents, so be sure to check it out before purchasing a full-size bottle. One thing that makes this body oil stand out from many other body care products is that it absorbs Pretty. Darn. Fast. Two seconds and the wetness is completely gone. This is one of only a few natural body oils that sink in so quick without leaving ANY trace but at the same time get rid of flaky, dry skin. Coco-Caprylate, Dicaprylyl Ether, Macadamia Ternifolia Seed Oil, Prunus Persica (Peach) Kernel Oil, Aleurites Moluccana Seed Oil, Simmondsia Chinensis (Jojoba) Seed Oil, Citrus Aurantium Dulcis (Orange) Flower Oil, Citrus Nobilis (Mandarin Orange) Peel Oil, Borago Officinalis (Borage) Seed Oil, Citrullus Lanatus (Watermelon) Seed Oil, Schinziophyton Rautanenii Kernel Oil, Tocopherol, Tocopheryl Acetate, Lavandula Angustifolia (Lavender) Oil, Rosa Damascena Flower Oil, Citral*, Citronellol*, Farnesol*, Geraniol*, Limonene*, Linalool*. *naturally occurring in essential oil. Vegan. The entire Aurelia Probiotic Skincare range is available at Naturisimo, Aurelia Probiotic Skincare. Have you tried any products from this brand? Is there anything on your wishlist? I liked the cleanser too! Would love to hear your thoughts about other products.